This June, Filipinos nationwide tuned in to the intensifying story of “Agua Bendita,” witnessed Jovit's triumph at the first “Pilipinas Got Talent,” and saw James Reid declared as the big winner in “Pinoy Big Brother Teen Clash 2010,” driving ABS-CBN to the top of the national, Mega Manila, and Metro Manila TV ratings surveys by Kantar Media/TNS. ABS-CBN trashed competition once again in the nationwide ratings game as it hit an audience share of 44 percent, or 13 points higher than GMA 7’s 31 percent. Metro Manila continues to become an ABS-CBN bailwick with the network’s audience share of 38 percent, or six points higher than GMA 7’s 32 percent. ABS-CBN bagged all ten slots in the combined weekday and weekend Top 10 most watched programs for the month of June with the hit primetime series “Agua Bendita” still taking the lead with an average rating of 40.3%. “Pilipinas Got Talent,” which witnessed the victory of its first ever grand winner Jovit Baldivino during the grand finals held recently at the Araneta Coliseum, secured the second spot for its Sunday airing with 37.2% and the third spot for its Saturday airing with 36.7%. ABS-CBN’s flasgship news program “TV Patrol World” remains as the most watched primetime newscast in the country with 32.9 percent versus its rival “24 Oras” which only landed in the 22nd slot with 21.3 percent. The much-awaited “Pinoy Big Brother Teen Edition Clash 2010: Unite at the Big Night” where Fil-Australian teenternational housemate James Reid emerged as the Teen Big Winner grabbed the 9th slot with 27.6%. 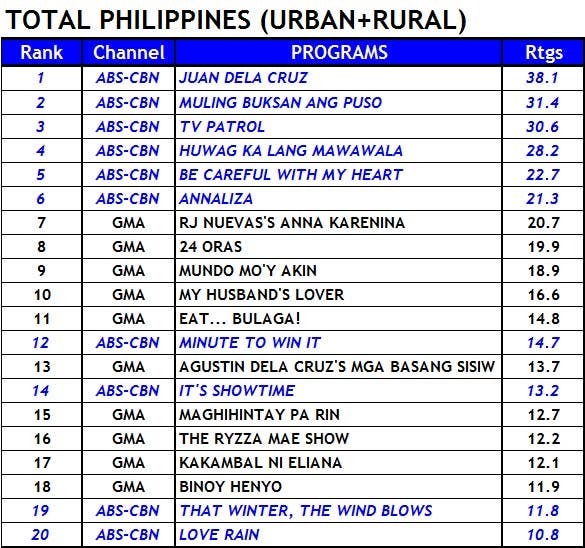 Newly launched fashion-serye “Magkaribal” topbilled by Gretchen Barretto and Bea Alonzo proved to be a strong contender in the ratings game as it ranked 11th in the overall programs for June with only less than a week of airing, hitting an average rating of 27.3%. Other ABS-CBN programs in the top 10 include “Kung Tayo’y Magkakalayo” (34.5%), “Maalaala Mo Kaya” (33.2%), “You Got It (Sunday)” (30.1%), “You Got It (Saturday)” (29.1%), and “Rated K” (27.6%). Kantar Media/TNS is a leading market research group in the world with a proven track record in audience research measurement systems in 32 countries. It started releasing its national television audience measurement (NUTAM) data on February 2009 with panels, composed of 1,370 representative households, covering urban Philippines and reporting on seven sectors namely NCR, Suburbs, North Luzon, Central Luzon, South Luzon, Visayas and Mindanao. ABS-CBN shifted to Kantar Media/TNS after filing a case vs. AGB Nielsen Media Research for failing to comply with its request to investigate alleged cheating and data tampering in TV ratings. The case is still pending in court.